This is complete fiction. 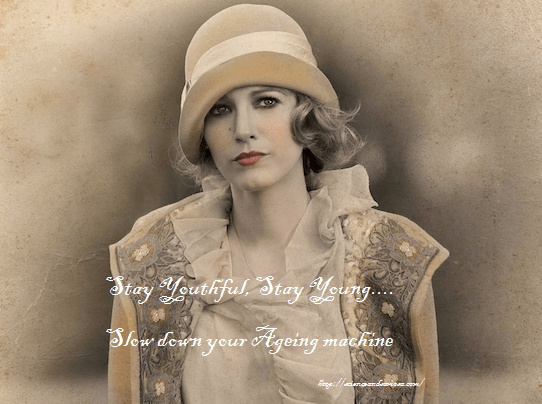 Nobody can stay young forever, but we can definitely slow it down with science backed ways. 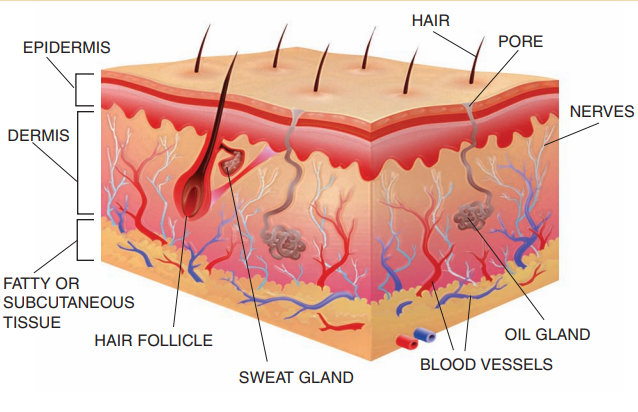 Skin is the body’s largest organ. A square inch of skin has millions of cells and many nerve endings for sensing temperature, pain, pressure, and touch. Skin is very sensitive and can get damaged if it is not cared for. We need to protect it from the sun, dirt and from irritants. As we grow older our skin also undergoes changes. Skin ages both from the inside and from the outside. Within our skin, collagen production slows and elastin becomes less flexible. New skin cells are produced less quickly, and dead skin cells are not shed as often. 54 percent of acne patients have marked alterations to the intestinal microflora. Acne, facial redness, eczema, psoriasis, dry skin, and rosacea could happen because of poor gut health. Having processed diet, stress and other lifestyle factors could result in a damaged or “leaky” gut lining (leaky gut is increased intestinal permeability or intestinal hyperpermeability), which leads to low-grade inflammation, oxidative stress and insulin resistance – all factors which have been linked to poor skin health. So take good care of your gut. Three primary structural components of the dermis, collagen, elastin and Glycosaminoglycans have been the subjects of the majority of anti-aging research. Collagen supplies the firmness and tautness in young skin whereas, elastin gives the skin elasticity. Glycosaminoglycans keep the skin hydrated or naturally moisturized. Include skin care products with Antioxidants, such as vitamins, polyphenols and flavonoids, to reduce collagen degradation. Look for products with cell regulators, such as retinols, peptides and growth factors (GF), which can stimulate collagen metabolism and influence collagen production. Vitamins C, B3, and E are the most important antioxidants because of their ability to penetrate the skin. Estrogen plays a key role in maintaining youthful skin. Estrogen levels gradually goes down in forties which makes skin dry and wrinkle prone. Whereas too much estrogen during pregnancy can lead to brown spots or patches. Male hormone testosterone can also cause trouble. Testosterone levels can trigger increased oil production, which could bring on breakouts — even in thirties and forties. Thyroid hormones can also influence skin’s appearance. Too much of the thyroid hormones can lead to warm, smooth, sweaty, flushed skin. Use appropriate diet to tide over hormonal imbalance. “One of the most important things you can do to keep a youthful, glowing appearance is to eat foods that provide your features with optimal nutrition,” says Lisa Drayer, MA, RD, author of The Beauty Diet. Include in your diet vitamin C rich food like oranges, broccoli, brussels sprouts, red peppers, and kiwis. They can boost production of skin-plumping collagen. Vitamin C is required to transform the lysine and proline into hydroxylysine and hydroxyproline, the forms of the amino acids necessary to rebuild collagen. Eat lot of veggies rich in beta-carotene like carrots, sweet potatoes, and spinach for smooth and soft skin. The omega-3 fatty acids in fish like salmon and trout as well as walnuts, flaxseeds, and chia seeds help skin retain moisture, and prevent dryness, redness, and even acne. Also the antioxidants in dark chocolate moisturize and soften skin, too. Sugar, on the other hand is a trouble maker, can latch onto the collagen in our skin, eventually leading to wrinkles. Include berries of all types — blueberries, strawberries, raspberries, etc. —to even out hormone troubles. Avocados contains plant sterol with anti-oestrogen properties and should be included as a part of hormone-balancing diet. Exposure to sun speeds up ageing process. The sun’s UV light damages elastin, making the skin less stretchy, which may contribute to forming wrinkles. The skin surface may become rough and leathery, and darker spots or freckles may appear. When sunscreen lotion is applied Inorganic chemicals in it reflect or scatter the light away from the skin, and organic ones absorb UV rays and protects skin from sun induced damage. A sunscreen with an SPF of 15 protects against about 93 percent of UVB rays, and one with an SPF of 30 protects against 97 percent of rays, according to the Mayo Clinic. What you eat, how you feel, how you address each of your health problem and how you choose the skin care products; all of them together leads to young and youthful looks. Wow thanks for the complete post! I try to eat well and do detox now and then. Drink a lot of water ect. So far people think I look like 25 and not 36 so I am doing something right! Nice post. I learnt many things about beauty secrets. Useful tips. Like a whole lesson on beauty .Thanks for sharing . No doubt useful post. This sounds very interesting! I totally agree with how messy it can get because of hormones … thats sad though. thanks for such an insightfull post. I must say the fact you shared here amazing. Wow. Thanks for sharing the post. It’s really helpful for people who need skin suggestions. I love your blog! So much info ! I have the worst habit of NOT applying sun screen – which ofcourse results in sun tan 🙁 nice tips that I neeed to follow! Skin is the biggest organ and the one we take so much for granted. I love how you;ve covered what you can do both internally and externally to keep your skin healthy. You connected beauty and science very well in this post. Cosmetic companies often come up with technical terms which we cant understand. But now we can relate. Thank you very much. Your post reminds me to use sunscreen. Nowadays I tend to skip them which has lead to dull skin. All other points are equally important and helpful as well. Your each and every posts just like a Small research work. Very informative and educated people like me. Thanks again for useful post. Again a very useful post on science and beauty… So much information in one single post… Amazing.. Gut Health is actually very important for skin health! Totally agree with you! You should be a part of a contest for one of the best blogs on the web. I am going to highly recommend this web site! You ought to take part in a contest for one of the finest sites on the net. I will highly recommend this blog! I have read a few excellent stuff here. Definitely value bookmarking for revisiting. I surprise how so much effort you place to make any such great informative site.